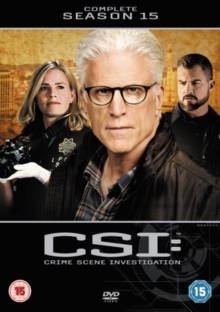 All 18 episodes from the fifteenth and final season of the US drama following a passionate team of forensic investigators who work the graveyard shift at the Las Vegas Criminalistics Bureau. The job of the team, led by D.B. Russell (Ted Danson), is to find the missing pieces at the scene that will help to solve the crime and vindicate those who often cannot speak for themselves: the victims. The episodes are: 'The CSI Effect', 'Buzz Kill', 'Bad Blood', 'The Book of Shadows', 'Girls Gone Wilder', 'The Twin Paradox', 'Road to Recovery', 'Rubbery Homicide', 'Let's Make a Deal', 'Dead Rails', 'Angle of Attack', 'Dead Woods', 'The Greater Good', 'Merchants of Menace', 'Hero to Zero', 'The Last Ride', 'Under My Skin' and 'The End Game'.